When the Ottomans denied Europeans access to the Bosphorus Strait, little did they know they would end the Dark Ages and cause a rush to the New World, as Portugal’s attempts to find India would result in the discovery of the Americas. 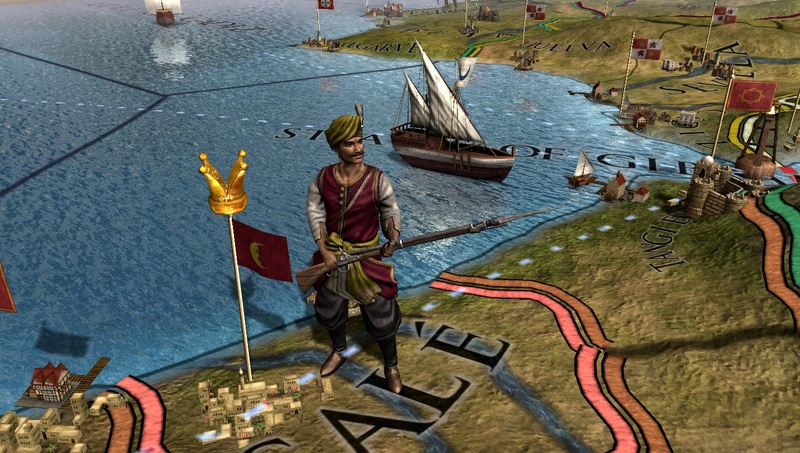 A DLC that strengthens the Iberian Peninsula has been a long time coming, and considering the historical nature of Europa Universalis IV, it’s strange Golden Century has followed Rule Britannia and Dharma rather than precede it. Nevertheless, this DLC focus on the early period of colonization has brought with it some enjoyable new mechanics and mission trees that help give the Iberian nations an even bigger push into the New World. Colonization in the early game is a lethargic process, and while Portugal and Castille have always had it much easier than other nations to begin their colonies, they can now speed up that process by expelling minorities to the New World. 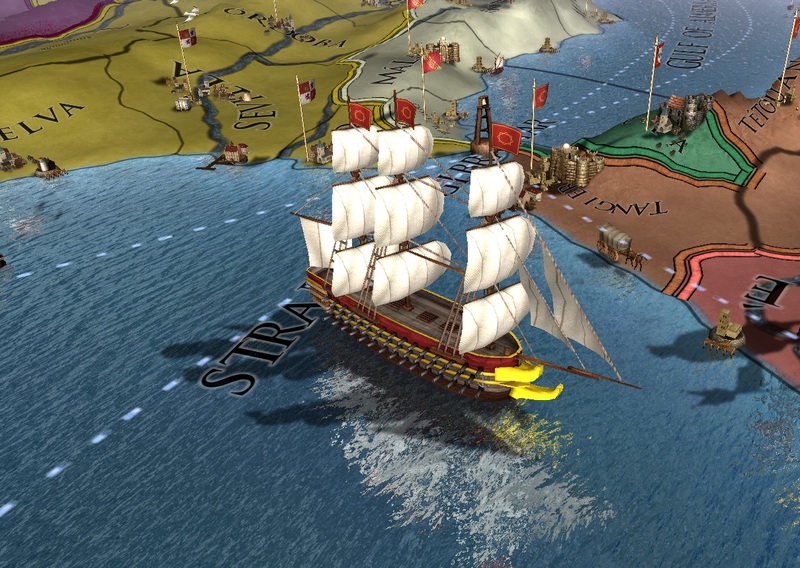 Putting some Andalusians on a ship and sending them to the Caribbean helps to increase the settler speed, resulting in establishing the colony sooner. The only downside is that the player can’t recall that colonist, and as such, when the Incan gold rush happens, can’t produce multiple colonies at once. It’s worth noting that filling the New World with irascible minority populations had adverse effects in history, and will have a similar result in Golden Century. While sending the Catalans off to Peru and creating a Castillian Barcelona might make life easier in Iberia, those now-enraged Catalans are sacking the city of Cusco and creating a strong economy of their own, increasing the chances of becoming disloyal to the Castillian crown. To ensure dominance over the colonial nations and to repel the pesky perfidious English and their attempts at piracy, a strong navy is perhaps more essential here than ever. There are a few improvements to the naval warfare, but nothing substantial yet. Ships can now weaken the walls of coastal castles by a naval barrage — essentially a mechanic taken from artillery in Mandate of Heaven and applied to ships — although the cost of fifty monarch points renders it too high a price to be worthwhile. Fortunately, building a flagship can have numerous adventurous in strengthening your naval abilities. A flagship comes with many different modifications to choose from, with three slots available. These can include increased durability or additional cannons. Oddly, only Portugal, Castille, and Holland have unique modifications, excluding some of the more notable naval nations such as England and France. This might first appear as an oversight, but it’s likely due to the historic bonds the Spanish and Dutch have, which is reflected in the new mission trees themselves. Much like Rule Britannia and Dharma, these new mission trees help to bring their region to life. As expected, the Spanish mission tree is particularly glorious, with missions across the New World and Europe that reflect its historical past. This includes missions to annex Holland, as well as dethroning the Austrian crown (or more accurately, obtaining the Habsburg chin). While not quite as global as the British mission tree, the Spanish mission tree has some particularly difficult missions that will result in some late-game incursions with the Holy Roman Empire. Such was how the Spanish Empire was influenced, particularly in regards to the Papal State, and there is a slight religious element to these new mission trees. 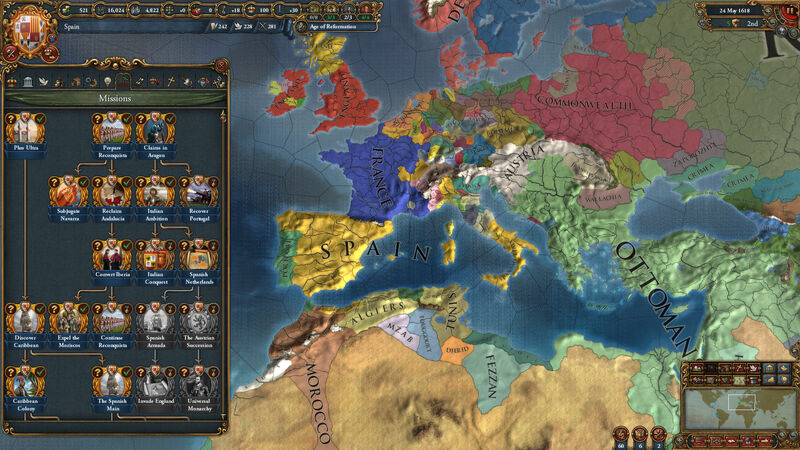 This is reflected in a new mechanic which allows Iberian nations to establish Holy Orders in their states, bringing additional benefits to those regions such as an extra administrative development or decreased culture conversion cost. These apply to both Catholic and Sunni nations on the Iberian Peninsula, with practically identical results. Additionally, like many of the mechanics that have been introduced in Golden Century, Holy Orders cost Monarch Points. As any Europa Universalis IV player knows, Monarch Points are the lifeblood of the game, and they can’t be wasted so needlessly. This means creating Holy Orders and expelling minorities to the Americas can only be done sparingly, resulting in the new features going unused in much of the game. This leaves the mission trees as the main reason to buy Golden Century, which in typical Paradox economics, the price doesn’t match the substance. Nobody expects the Spanish Inquisition; their chief weapons are surprise, fear, ruthless efficiency, and an almost fanatical devotion to the Pope. Unfortunately, while Golden Century has some enjoyable features, it doesn’t affect the core game enough to be as unexpected as the Inquisition. The only reason to buy this expansion would be if the player has a preference for Iberian nations. If so, then it’s fantastic. Lost his ticket on the 'Number 9' Luxury Express Train to the Ninth Underworld. Has been left to write articles and reviews about games to write off his debt until the 'powers that be' feel it is sufficiently paid.